Social media and text messaging allow us to quickly share news and proclaim our love and appreciation for each other to the world. Broadcast messages are fun and nice, but let’s not forget that when it comes to etiquette and manners, Thank You notes are still in style! In general, we all know to write thank you notes for weddings, birthdays, and other tangible gifts, but those are not the only occasions when Thank You notes are appropriate. When those around us are giving us their time, thoughtfulness and heart it is only fitting that we show our appreciation properly. There are a number of thank you’s necessary this time of year. So get out those classic, whimsical, plain or colorful notecards and let’s get started. Your fabulous Faviana gown has arrived. Meanwhile, you chose different shoes to go with it and now need a last minute hem. Your seamstress or tailor drops everything to make necessary alterations. Post prom, send a note of thanks. Alterations, a necessary part of being perfectly put together, are made by hand and with great care. Let the person who made your night so special know how thankful you are. Don’t forget the mom who had all of the Prom-goers and their parents over beforehand. Perhaps they provided the perfect background to group pictures and offered refreshments. 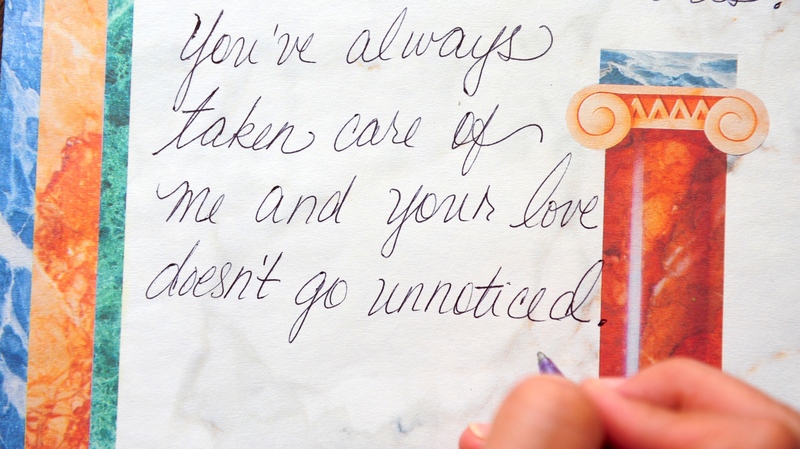 Whenever someone opens their home to you, a note is the right touch of appreciation. Near the end of the school year, many of us are receiving accolades through certificates, trophies, plaques, scholarships and more. In our excitement at being called to the stage many focus on the photos and social media blasts. But let’s not forget the coaches, teachers, administrators, foundations, civic and community groups behind the awards. College-bound students especially, remember to give thank you notes for those who wrote your letters of recommendation. Also, organizations and foundations who provide scholarships should receive a handwritten note acknowledging your appreciation for their contribution to your future. Behind every humanitarian, civic, and community award is a person or committee who reviewed applications, read essays, considered the merits of each and every candidate. Your moment on stage is the result of their careful consideration and truly deserves your appreciation. This goes back to what was noted above. Anytime anyone opens their home to you, thank you notes go a long way! Whether it is your friend’s parents or family members, someone at summer camp, or just new friends you made during the season, writing a simple thank you note expressing how grateful you are to know them and to have them being kind to you means so much. It only takes a moment of your time to write and mail a proper card, but the impact is timeless. Here at Faviana one of our mantras is to celebrate yourself, and we know that sometimes celebrating others is the best way to celebrate yourself! Thanks for reading! Do you have a favorite type of card for thank you notes? White cards vs. colorful ones? Let us know what you think by tagging us on Instagram @glamandgowns, and Faviana’s Instagram @Faviana_NY and Twitter @FavianaNY. Also, don’t forget to subscribe to our Youtube channel for more fun vlogs @FavianaNYC! Amanda is a Faviana Brand Ambassador, to find out how you could become one of our Brand Ambassadors, click here!